The Ukrainian army is essentially a ‘NATO legion’ which doesn’t pursue the national interests of Ukraine, but persists to restrict Russia, President Vladimir Putin says. “We often say: Ukrainian Army, Ukrainian Army. But who is really fighting there? There are, indeed, partially official units of armed forces, but largely there are the so-called ‘volunteer nationalist battalions’,” said Putin. He added that the intention of Ukrainian troops is connected with “achieving the geopolitical goals of restraining Russia.” Putin was addressing students in the city of St. Petersburg. Kiev has been reluctant to find political solutions to the crisis in eastern Ukraine and only used the ceasefire to regroup its forces, the president stressed. “Unfortunately official Kiev authorities refuse to follow the path of a peaceful solution. They don’t want to resolve [the crisis] using political tools,” Putin said, adding that first Kiev authorities had first used law enforcement, then security services and then the army in the region. 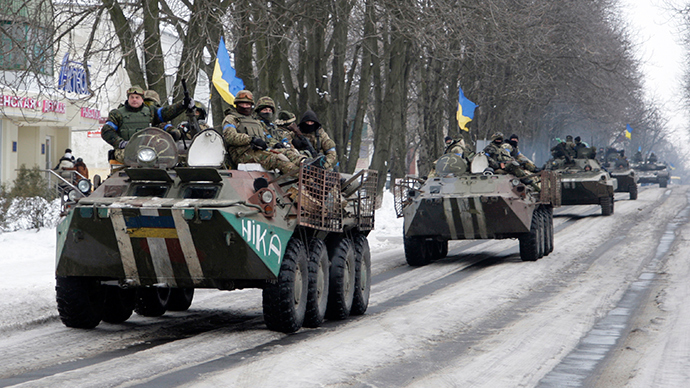 “It is essentially a civil war [in Ukraine]. In my view, many in Ukraine already understand this,” Putin added. "The statement that there is a NATO legion in Ukraine is nonsense. There is no NATO legion," Stoltenberg told reporters. Already tense situation in eastern Ukraine gone downhill in past 2 weeks. The escalation of violence came after a controversial incident at a Kiev-controlled checkpoint near the town of Volnovakha, where 12 passengers were killed on January 13. Kiev and the militia blamed each other for the incident. Following escalation, Kiev ordered “massive fire" on militia-held regions on January 18. The self-proclaimed Donetsk republic’s leader accused Kiev of trying to restart the war. Donetsk Region was shelled. At least 30 people were killed and over 100 wounded. Kiev and militia troops traded blame, with rebels insisting they didn’t’ have weapons close enough to the city to carry out such a deadly attack. Western countries reiterated accusations of Russia backing the rebel forces, and so being partly responsible for violations of the Minsk agreement. They called for more sanctions against Moscow. On Monday, US President Barack Obama promised the United States would examine options to "ratchet up the pressure on Russia" on the Ukraine issue. At the same time, US Treasury Secretary Jack Lew said Washington has "more tools" available to increase pressure on Russia. "I think we have seen that the sanctions work to create real stress in the economy. We have more tools. I am not today going to enumerate what the tools are but we have more tools," Lew told a news conference in Brussels.